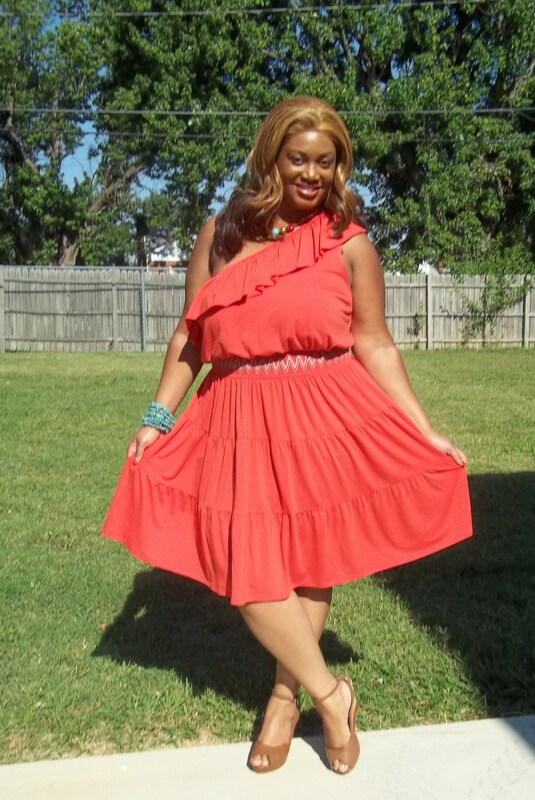 Today I wore my new orange one-shoulder tiered dress that Torrid sent me last week to review. As many bloggers have already recently posted, orange is a key color right now. From the moment I put the dress on it was pure comfort. The polyester/rayon material was perfect for a not-so-hot day like today here in VA. I usually wear wide belts with my dresses but there was already a tribal print stitching at the waist so I based my accessory selection from that print. The waist area has brown, white and turquoise sewn into the gathering. Therefore I added these brown wedges, also sent to me by Torrid, to offset the brown and turquoise in my necklace and bracelet. All throughout the day I felt extra girlie just from having this dress on. So much so that I treated myself to a spa pedicure this afternoon. I would definitely suggest purchasing this dress if you have a movie date, girls night out or to wear during summer travel. It’s very stylish, comfy and carefree! Simply stunning! I have this dress on my blog as a sizzling, summer, must have! Stay fabulous! You look great! Orange is amazing on you! You look wonderful! I’m a plus size, BUT most clothes I try on don’t sit right because I carry my weight in the front. It seems like maternity wear looks better on me than the average plus styles. Any suggestons?